Okay, so there was no real bridge crossing to enter Belgrade, though as I learned in my few days in the city, there most certainly is a lack of bridges from one part of the city to the other. It might be the only complaint I heard while there, that there are just not enough bridges, and the ones that are open don’t have enough lanes for all the traffic that attempts to flow through them. Belgrade was a bridge of different sorts for me. It was a bridge to A’s childhood. A bridge to his family and friends, a bridge to a language and culture I know nothing about, and a history so foreign from my own. But in spite of, or perhaps because of, all of the differences, it was without a doubt one of my favorite places I’ve ever visited. For all that is different about it, and for all that I learned and experienced being there in the comforts of a local, I am excited to plan the next visit back. I arrived on Friday night to rainy weather, which pretty much stayed with us throughout the weekend, (but gave us slight hope every so often with breakthrough bursts of sunshine.) We went over to his cousin’s place, drank some of the wine his father makes at home, and headed to a club with a live band. I recognized most of the music, who doesn’t recognize American 80’s, and enjoyed the 35 Euro champagne we had delivered to our table until the smokey bar became too much, and the realization that I had a hair appointment bright and early in the morning and it was well after 2 sunk in. The ceremony was completely different from any I’ve seen before. 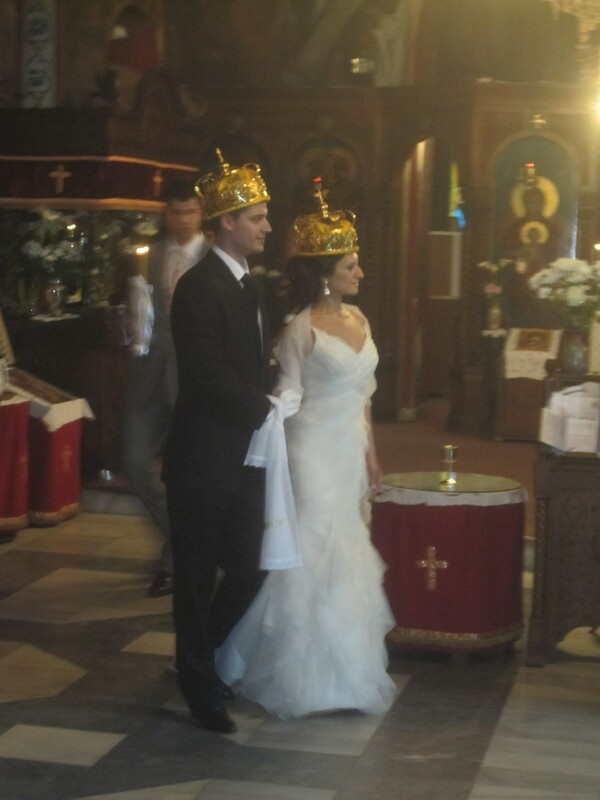 It was in a small Orthodox chapel and the bride and groom were surrounded on both sides of the room by family and friends, all standing. They were in the middle and performed rituals I didn’t quite understand, but that involved wearing a crown and walking in a circle three times with the priest in front and smoke (incense?) in hand the room. Then once the Bride and Groom were pronounced, and every guest visiting had the opportunity for individual photos with the B&G you stepped outside to a beautiful courtyard where there was a live band! Okay, that might be a bit of an overstatement, as I later learned, since it was a gypsy band that would play as loud as they could and would stand directly in front of whoever looked like they might have some change to spare and blow their trumpet into your face until you gave in with a couple of rolled up bills, (having never seen this before, I still thought it was pretty cool!) We then headed off to the reception which was in a completely separate part of the city where we awaited the B&G with cocktails in hand and hor d’ourves. The party lasted late into the night, with the Best Man pleading for another round at a club to follow. Of course as we were about to head out, it became evident that all the Best Man, (and any of us) needed was a comfy bed to spend the night…and probably a few less drinks than we had already had. The wedding was just a part of the weekend, albeit a big one. 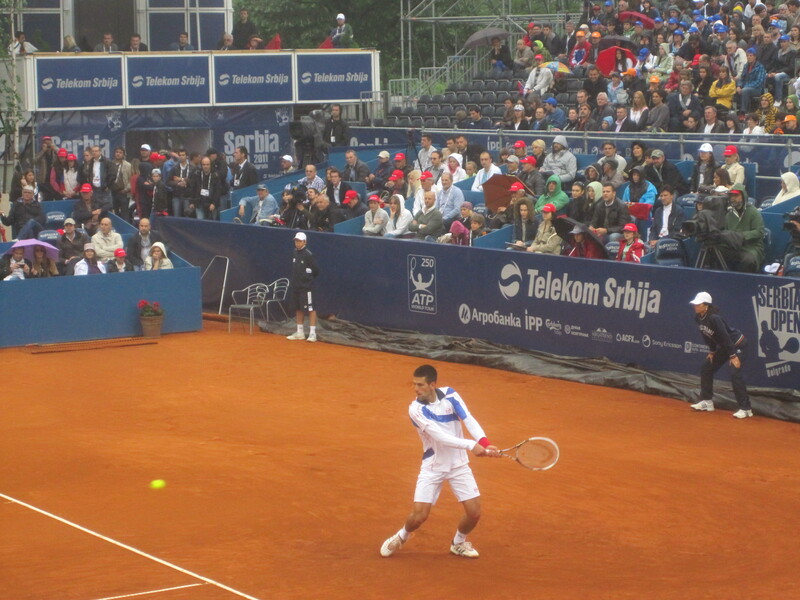 But also included was the Serbian Open where A, his dad, and I watched national-hero Djokovic win gold, and a trip to a nearby bakery where we had delicious desserts with his mom. Even though he was being a total diva, I guess he deserves to win in the stadium named after him! I left this whirlwind weekend behind with thoughts and dreams of returning to get to the know the city and A’s family better one day. And until we returned a month and a half ago, just dreams they were. 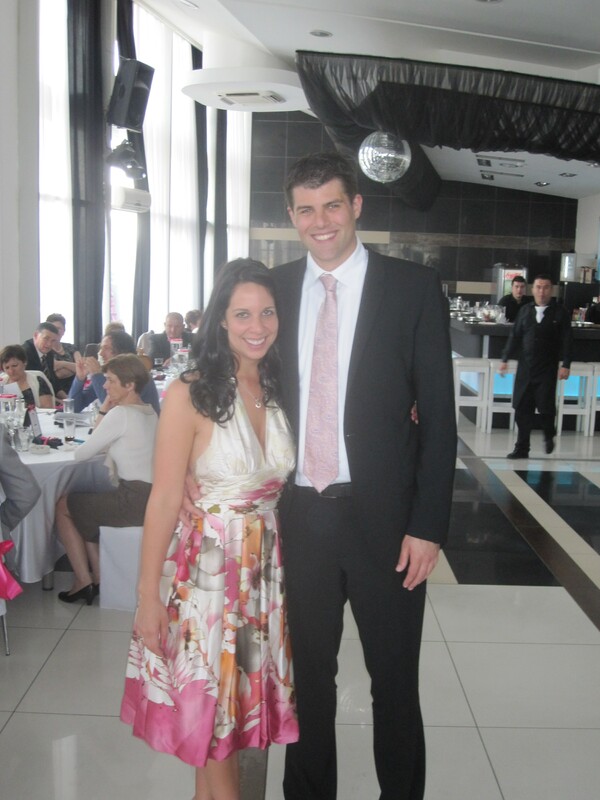 This entry was posted in Travel, Uncategorized and tagged Belgrade, Europe, Love, Serbia, Travel, Wedding. Bookmark the permalink.